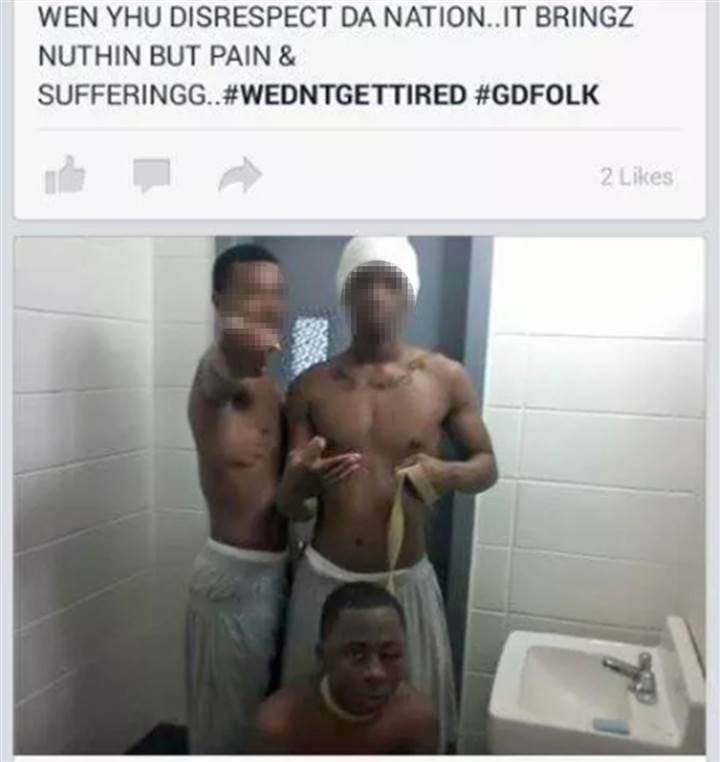 Disturbing photos of a teen beaten at a Georgia prison apparently captured on an inmate's cellphone made it onto Facebook before corrections officials even knew he had been hurt, the victim's family told NBC News on Wednesday. Cortez Berry was assaulted at the Al Burruss Correctional Training Center in Forsyth in what his family says was an gang attack. The assailants apparently posted cellphone pictures to Facebook showing Berry crouched below two shirtless young men, his eye swollen shut and his neck threaded through a makeshift leash. After seeing the pictures online, his relatives say they made panicked calls to the facility that went unanswered until Berry's aunt, Shavonda Wright, drove to the prison and knocked on the door. "I rang the buzzer, nobody came," said Wright, 34. "So then I called and I said you have to go check on my nephew. I said there is something wrong with him because we have seen disturbing photos." The Department of Correction said the attack was under investigation. It confirmed Berry is the teen in the photo, making him the latest high-profile victim of a prison system advocates and families say is out of control and highlighting the growing presence of cellphones in prison. Earlier this month, NBC News reported the DOC confiscated more than 13,500 cell phones last year. In some cases, they have been used to extort families of other prisoners. The Augusta Chronicle reported that Berry's girlfriend got a call demanding $300 to keep him safe, but the caller hung up. Wright and Harris said they received no demands, but that Berry told them the beating was gang motivated. "They said bro, you might as well go ahead and join the GD, because you're about to turn 18," Berry said, according to Wright. At 18, he would be moved from the juvenile to the adult areas of the facility. "WEN YHU DISRESPECT DA NATION...IT BRINGZ NUTHIN BUT PAIN & SUFFERINGG.."
"Oh my God, eyes swollen, his eyes bloodshot red," she said. According to Wright, no one noticed her nephew had been beaten for hours, until she arrived Friday night and demanded they check on him. "No guard was there to help him," she said. "That's not right. I'm a taxpayer. I'm paying you to keep everyone safe in the prison." Berry who is five feet tall and 115 pounds, according to correction records was 14 when he was charged with aggravated assault, robbery and theft of a motor vehicle and sentenced to probation in juvenile court. In November 2013, he violated his probation, and was sent to a juvenile facility. Georgia treats all 17 year old as adults in criminal proceedings, so on his next birthday, he was sent to Burruss. His mother said his time there was fairly calm. He received one disciplinary action, when he didn't want to have his haircut, but "never had any problems there" beyond that, Harris said. DOC statistics indicate that in comparison to other Georgia prisons, Burress doesn't generally raise flags. The facility, which held 86 juveniles as of June, reported no serious injuries last fiscal year and confiscated just 31 phones. The agency website shows Berry now has been moved to Smith State Prison, a notoriously violent facility in the pastures of southeast Georgia. Smith has seen more homicides in the past five years than any other in the system, an analysis by the Southern Center for Human Rights found last year. At least 35 prisoners and one officer have been killed in Georgia's prisons since 2010, according to a report by the Southern Center for Human Rights and data from the Georgia Department of Correction. Other Georgia prisoners have survived being slashed with homemade machetes, burned and brutally beaten. "I'm afraid for him," said Berry's mother. "Because it's been all over social media, because the world has seen it. 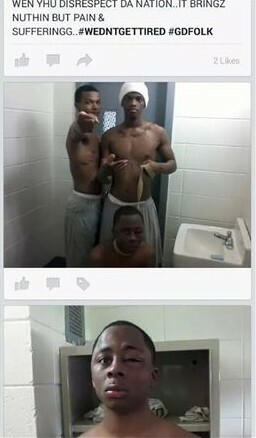 So if they have cellphones in that prison, they have seen it. I'm afraid they might kill him." Berry's family sees the presence of cellphones in prison as a double-edged sword. "If the photos didn't make it to social media, we probably wouldn't have known," said Wright. "That's the only way that we got the information."